It’s supposed to be about 60 degrees in New York City today, but since I don’t really believe that’s true (can we ever trust the weather here in NYC?! ), I’ve been dreaming about the upstate getaway I embarked on a couple of weeks ago. I was lucky enough to get a few days off work and school for spring break — now that’s something I’ll miss about college! 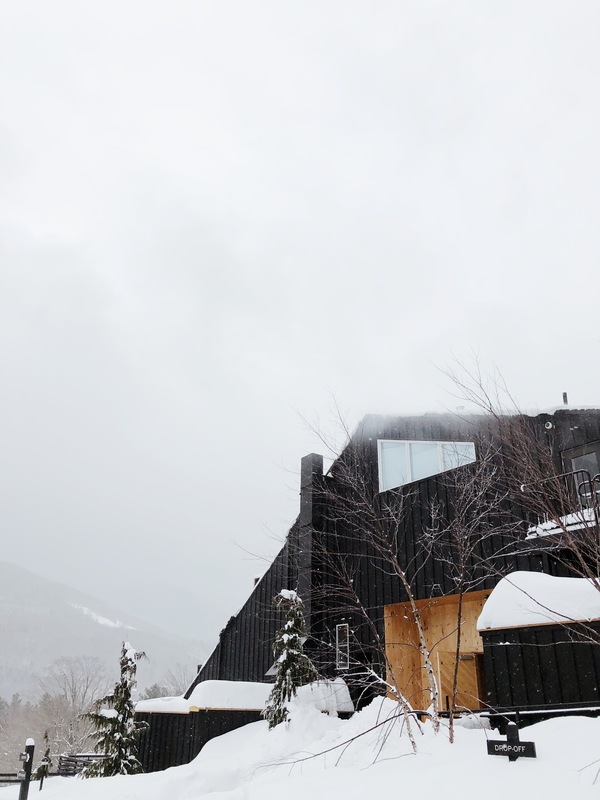 — and instead of jetting off somewhere, I decided to stay local and head to the Catskills. 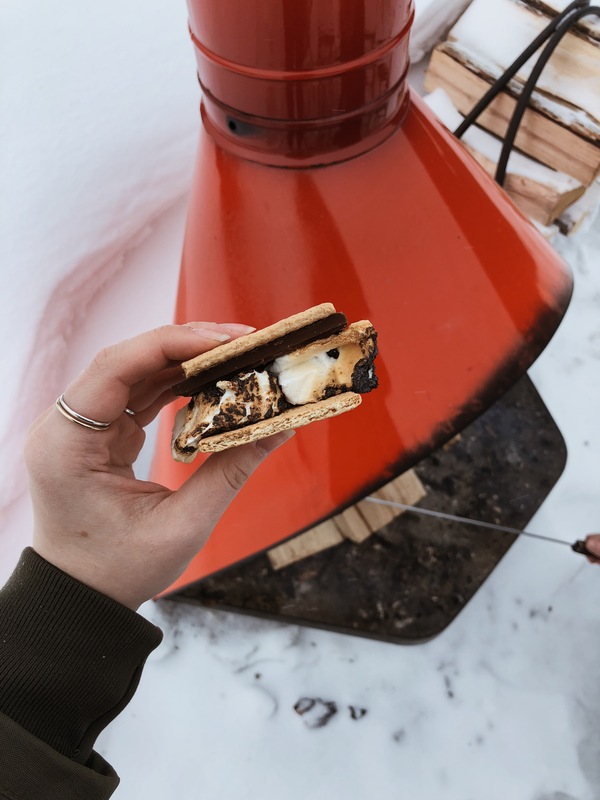 Personally, I’m not a winter person at all and I’d much rather be basking in warm temperatures than shredding the slopes, but there has been something drawing me upstate lately and I finally decided to follow my instincts. You may remember Krystal and I took a jaunt to the Hudson Valley area this summer for a fitness retreat. That was my first visit upstate, and just driving through the beautiful New York countryside had me craving more fresh air immediately. This vacation, I was dying to relax and get away from the hustle and bustle of city life. I’d just been feeing so exhausted and burnt out, and I knew I needed some quiet. 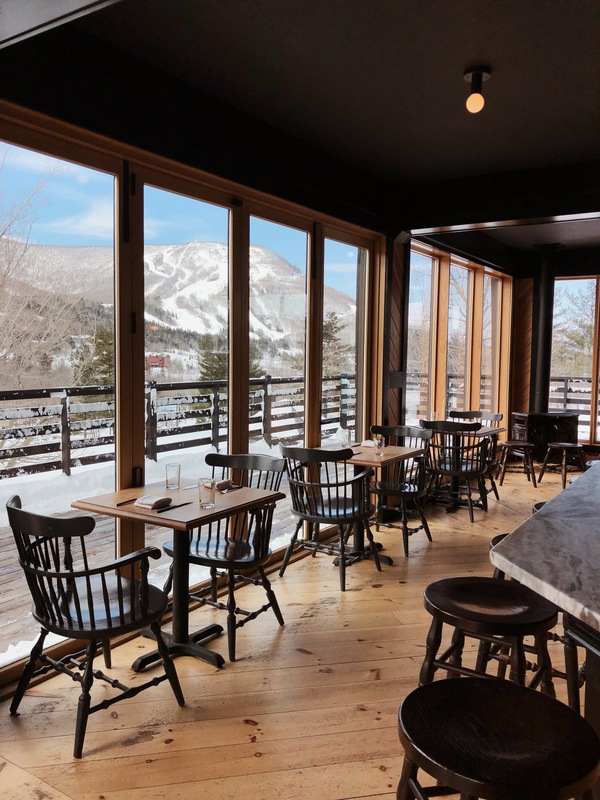 You’ve probably seen the gorgeous Scribner’s Lodge all over your Instagram feed — and for good reason. Located in Hunter, NY, Scribner’s is like an oasis within an oasis. 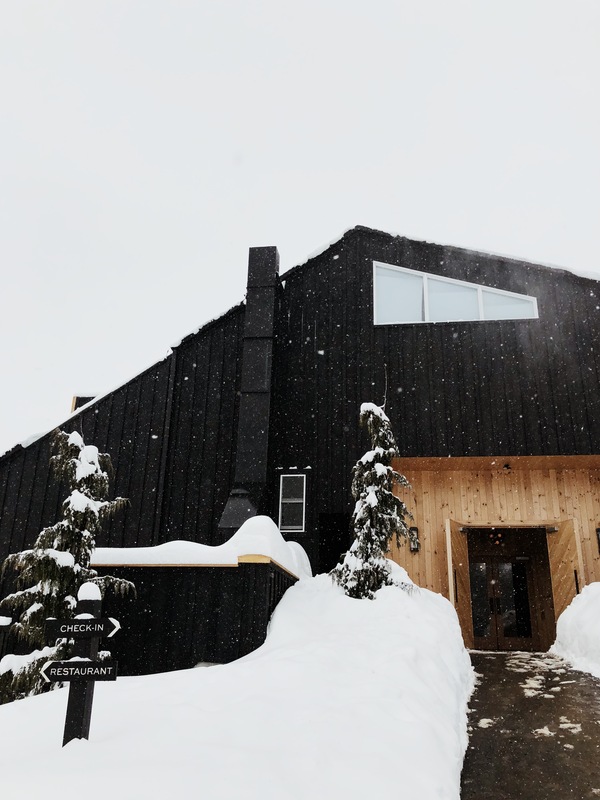 Surrounded by stunning mountain ranges and sparkling snow, the lodge is all warm-toned wood and rustic details, with amenities abound. It’s even more picturesque in person, if you can believe it. 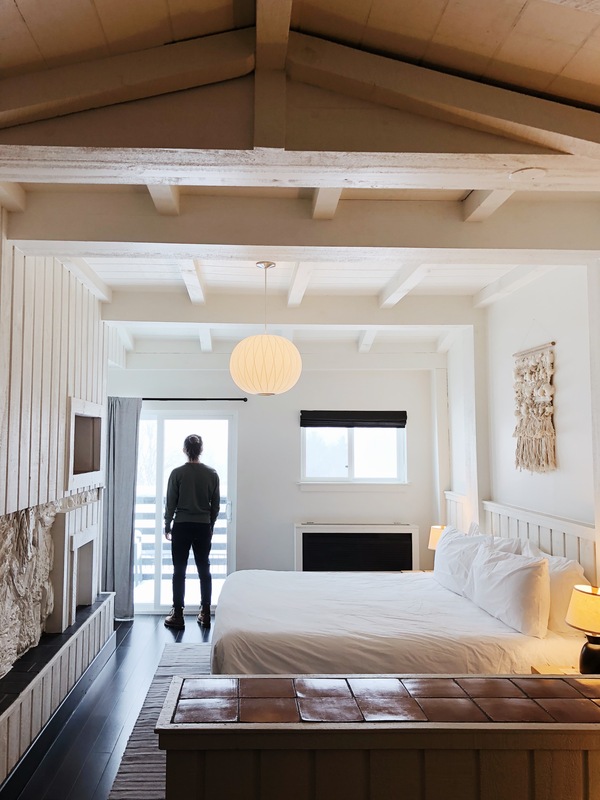 We booked a two-night, three-day midweek stay, and it really couldn’t have worked out better. I loved staying during the middle of the week because it really felt like we had the whole lodge to ourselves. I parked myself on the couch by the fire in the beautiful sitting room and read a book for hours, sipping sparkling water (on tap!) and anxiously waiting to roast s’mores. We were lucky enough to be upgraded to the insane Bungalow King room, which boasted the most luxurious king-sized bed, views of Hunter Mountain, and a sunken living room where we enjoyed pre-dinner champagne. Max even nodded off for a couple hours on the bench, it was that comfy! 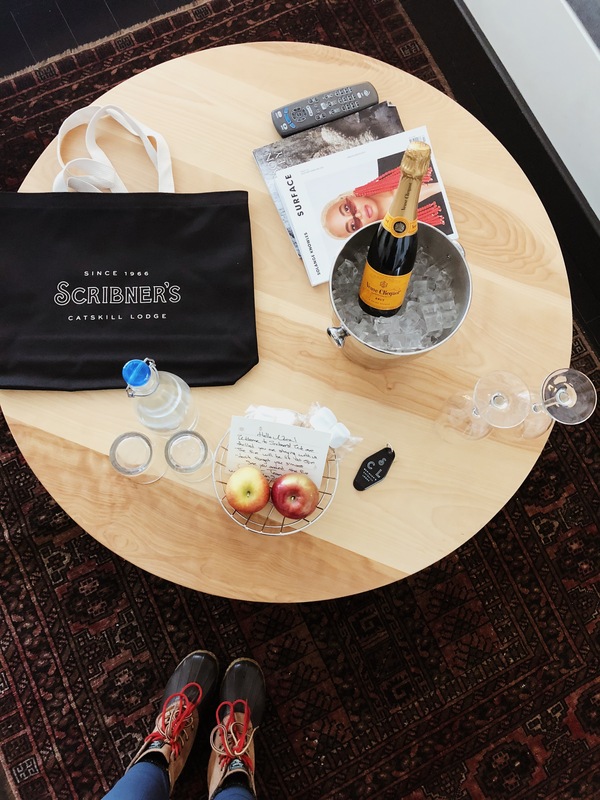 I didn’t have much planned when we left for Scribner’s — which was a bit scary to me, a big planner — besides a few restaurants and shops I wanted to check out (more on that below!). Instead, I was content with spending most of our time in the lodge to really attempt to unplug. The first day we arrived, Scribner’s restaurant was closed, so we ventured out into the little town of Tannersville to find lunch. 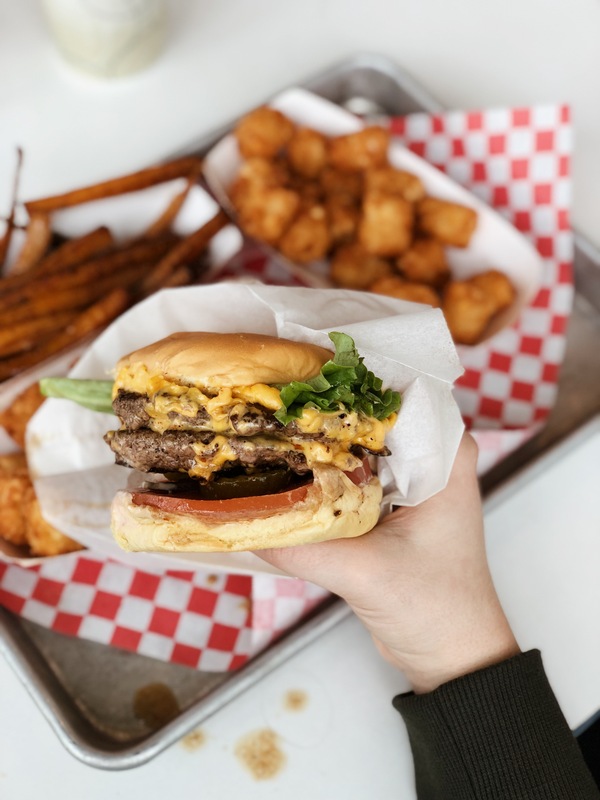 We ended up at Mama’s Boy Burgers, which, if you like amazing burgers, is a must-visit. Our hearty lunch seriously satisfied my road-trip cravings while also being locally sourced and grass-fed. After an afternoon nap, we headed back into town to visit Jessie’s Harvest House, which everyone on the staff highly recommended. Again, the food was sourced locally, which definitely showed in the flavors of our meals. Max got salmon and I got chicken and both were just incredible. I didn’t take any photos of the meal (which is kind of a big deal for me! ), in an effort to really be present. It was just lovely. On Wednesday, we decided to drive to nearby Woodstock to check out the town. Since it was off-season and also the middle of the week, a lot of the adorable shops were closed, but we found some great spots anyway. Fruition Chocolate was amazing (hello, samples!) and we walked away with some delicious chocolate bars for ourselves and for gifts. We got a quick bite at Bread Alone, which I love to shop from at the farmer’s markets in Manhattan, so it was great to visit their upstate outpost! We each got soup, of course with a side of bread, and it really hit the spot. I swear everything upstate just tastes fresher! We also loved seeing all of the vintage Woodstock posters around town. It was so charming and I can only imagine how darling it must be in the summer when everyone is out and about. That night, we had dinner at Prospect, the restaurant in the lodge. Needless to say, it was unbelievably delicious. We sipped on cocktails by candlelight and dined on pork chops and fish tacos. There’s something about the restaurant that is so calming. Sitting by the window, looking out at the mountains…it’s just divine. 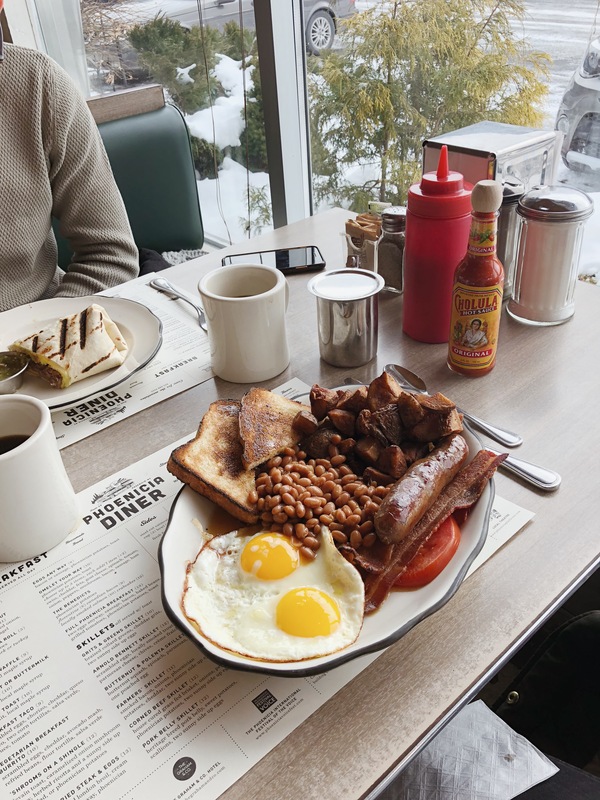 Thursday was check-out day, so in the morning we rushed to Phoenicia Diner, another Instagram darling, before we had to leave our room. 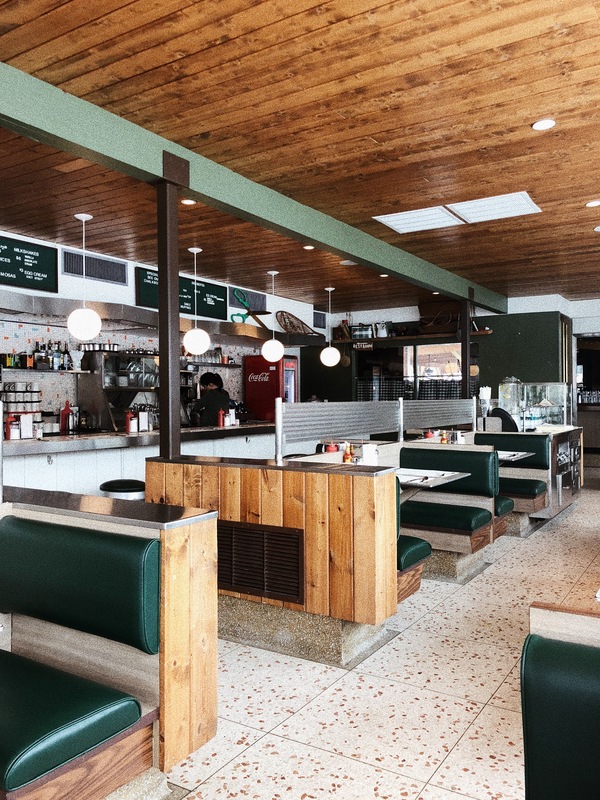 I’m obsessed with retro diners, so I was having mini freak-outs the whole time we were there. Max had finished half of his breakfast before I’d finished taking photos of mine, ha! Once we checked out — which was so sad, I didn’t want to leave! — we drove over to Hudson to peruse vintage shops and grab coffee. We both walked away with some new vintage pieces we loved, and we snagged lunch at ANOTHER vintage diner (be still my heart! ), Grazin’, who I also buy from at farmer’s markets and who also serves local, sustainable food. 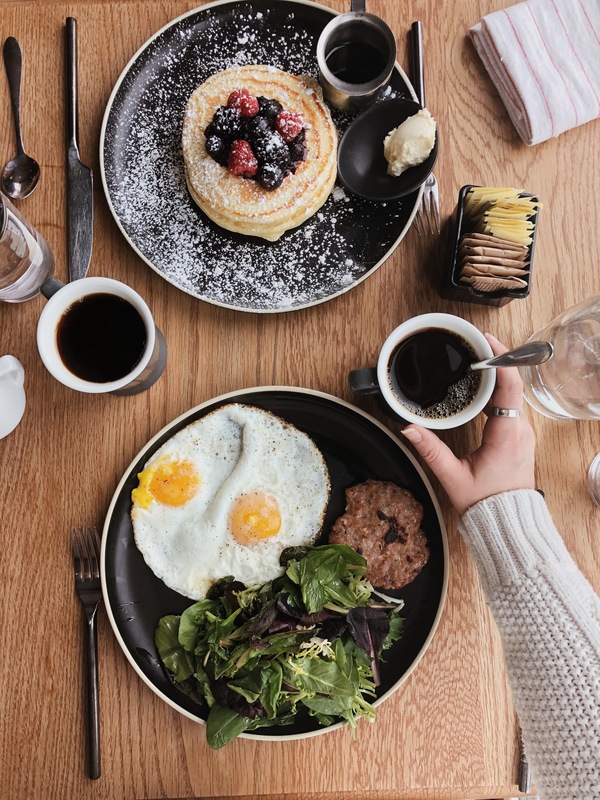 How cool is the food scene upstate? I’m in love. All in all, it was the best quick getaway, with Scribner’s being more beautiful than I could’ve imagined. Everything was just perfect. Thank you so much to the team at Scribner’s for having us — I can’t wait to be back! If you’re planning a trip to upstate New York, you have to stay here. Thank me later! Do you have any upcoming trips you’re excited about? 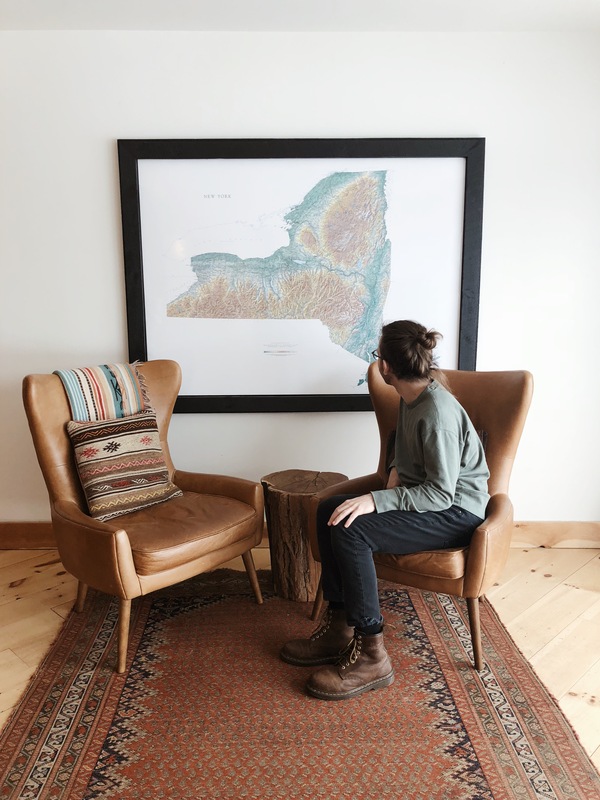 Have you ever been to upstate New York? Let me know! 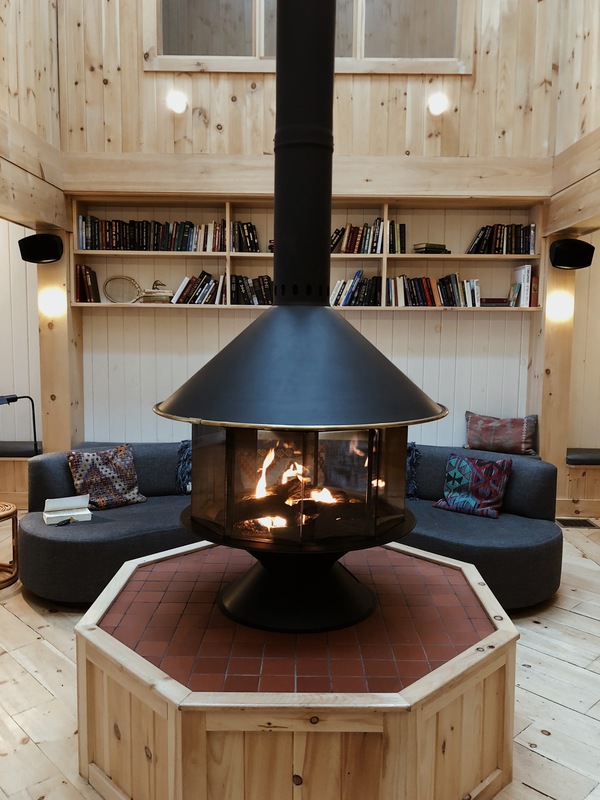 Travel and catskills, scriber's lodge, travel, upstate, upstate ny, winter getaway. Wow, looks like a really wonderful place to stay! I’m heading to Seattle for the first time ever in two weeks and I’m really excited! 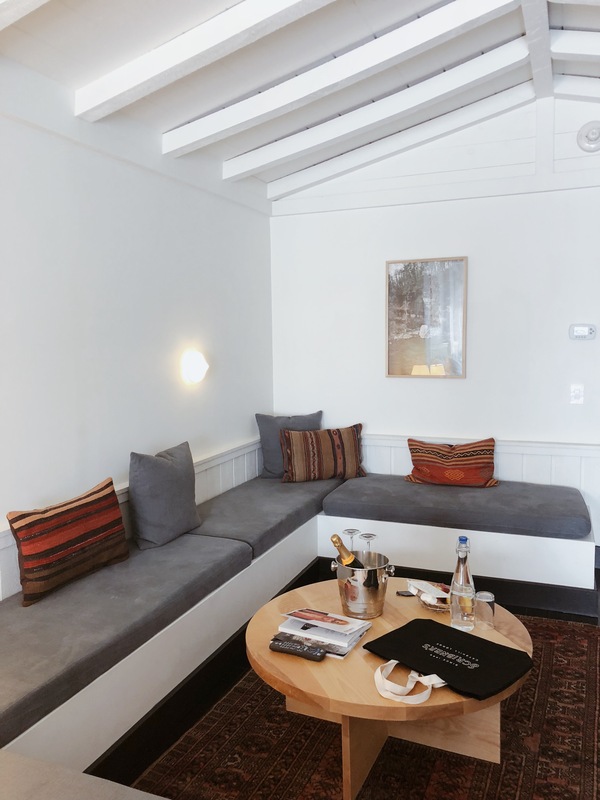 Loved this post, Nora, and heard such great things about that place — such a fun getaway from the city! So beautiful and comfy! I’m heading Scribner’s first chance I get! Thanks for the list! P..S. Still awaiting my gift Fruition chocalte bar. Must be lost in the U.S. post?